Personal branding has become increasingly important. Creating and maintaining an authentic personal brand is important for those in professional services. What’s more, your personal brand has never been more transparent and accessible to stakeholders, with the advent of digital and social media, and the proliferation of online business, marketing and communications. The importance of ‘walking the talk’. You’ll also gain insights into best practice and key pitfalls that can be encountered when building your personal brand, and discuss the value of brand consistency in the online and offline space. 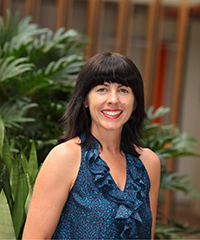 Dr Nicole Hartley is the Associate Director of the UQ Business School MBA program. She is also an internationally recognised research academic in the field of consumer psychology, services marketing and digital technology. Her specific research interests include customer experience, service technology, customer-brand relationships, new media and service innovation. Prior to her academic career, Nicole was employed as Marketing Manager/Director for various corporations within the tourism, education and communication industries both in Australia and in the UK. Please note this event is open to all (members, non-member, women and men).